This simple recipe is a sure hit with kids and parents alike. With only 4 ingredients it’s cheap and effective. Preheat oven to 450°F. Combine broccoli, drained tomatoes and dressing in medium bowl. For each packet, lay two 20×12-inch sheets of regular foil on top of each other. Place 1 chicken breast on each foil packet. Spoon broccoli and tomato mixture equally over each chicken breast. 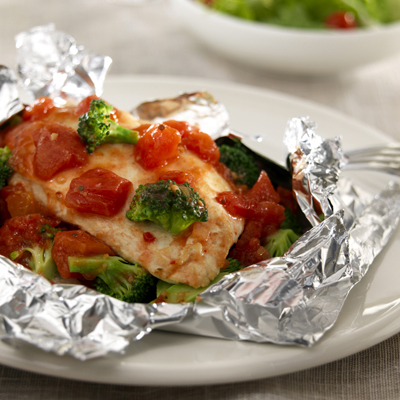 Bring up short sides of each foil packet and double fold top. Double fold both ends to seal each packet, leaving space for steam to gather. Place packets on baking sheet; bake 20 to 25 minutes or until chicken is no longer pink in centers (165°F). Carefully open ends of packets to allow steam to escape before fully opening. I can’t cook, but I may be able to pull this off! Looks tasty!